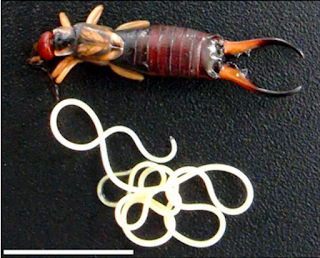 Meet Mermis nigrescens, a nematode worm which arrived in New Zealand inside European earwigs (Forficula auricularia). Mermis nigrescens is a species which had been known since 1842, and it is likely that it might have even been discovered earlier than that in 1766, but was mistakenly identified as Gordius - a genus of hairworm - which despite superficial resemblance and a similar life cycle, belongs to a different phylum. Its host, the European earwig, first arrived in New Zealand during the 19th century, but it was only recently noticed that these insects have also brought along a parasite from their original home range. Like other nematodes from the family Mermithidae, M. nigrescens are aquatic as adults and only parasitise earwigs during their juvenile stage. An earwig can be hosting anything from a single worm up to as many as seven of those parasite. When M. nigrescens reaches maturity, it needs to get into a water body to mate and reproduce. 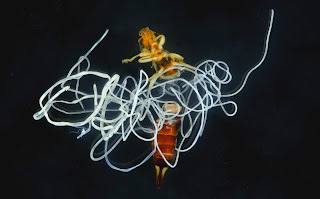 And if they're anything like the hairworms and other species of mermithids, it would commandeer the earwig and steer it to water, where the worm can evacuate its host xenomorph-style and leaves the now hollowed-out earwig to drown. So how do we know this parasite is an introduced species and isn't one that the earwig had simply acquired in its new home? Molecular analysis looking at three genetic markers from M. nigrescens showed that the closest relatives of these particular nematodes are found in Canada - M. nigrescens appears to be well-travelled, and is found all over the world. But it does not seem to be as abundant in Dunedin, New Zealand as seen elsewhere in world. In the population that was examined for this study, only 19 out of the 198 earwigs examined were infected with M. nigrescens, whereas a study in Tasmania, Australia found the parasite in half of the earwigs examined, and it was even more common in Ontario, Canada where infection prevalence reached 63%. It is currently unknown why M. nigrescens does not seem to be as abundant in New Zealand as it is elsewhere in the world, though it could just be something about this particular bunch of earwigs and that there are more heavily parasitised earwig populations elsewhere in New Zealand. But where did the M. nigrescens population in New Zealand originate? While its closest living relatives are found in Canada, did it arrive to New Zealand from there? After all, the original home of M. nigrescens is Europe, so the Canadian population was not native to that region either. The missing piece of this puzzle is genetic sequences of M. nigrescens specimen from its original range in Europe, which might resolve where this newly discovered New Zealand population originated - from Europe or elsewhere. For all we known, this supposedly widespread species may in fact be composed of a complex of closely-related cryptic species, with each species found in a different region of the world. Just goes to show that even in the common earwig, there are natural history secrets waiting to be revealed. Many parasite can cause health problems for their hosts, but aside from those that infect humans and domestic animals, it is not entirely clear just how much impact most parasites are having on the host population. Of course, the problems caused by parasites for a host goes beyond direct pathology; for social animals, parasitism can also affect how individuals interact within a group. In this post, we will be discussing a study which investigated the impact of a tapeworm on a population of gelada baboons (Theropithecus gelada) in Ethiopia. The tapeworm in question is Taenia serialis, which is related to some more well-known species of tapeworms include the beef tapeworm and the pork tapeworm. Despite being commonly used in first year biology textbook as a "typical" example of a tapeworm, Taenia is anything but typical in terms of its life cycle compared with most other tapeworms. Like other parasites that have a complex life cycle, the larval stage dwells in an animal known as the intermediate host - this is where the parasite grows to a certain size before being eaten by a predatory animal which serves as the final host (definitive host), where it will mature into a sexually reproducing adult worm. Taenia does something different in its intermediate host - an adaptation found in the evolutionary play book of the digenean flukes and some other parasites. Instead of merely growing larger and await consumption by the final host, they asexually multiply inside the intermediate host - making many genetically identical copies of themselves and forming cysts which contain hundreds or even thousands of larval clones. As you can imagine, having a slowly growing bag of worms lodge inside your body is not good for your health (it actually served as a plot device in an episode of House), but just how much does it impact a population of wild animals? The paper featured today is the result of a long term study stretching from January 2007 to June 2013 monitoring the health and demographic data of 16 gelada bands on the Guassa Plateau located on the western edge of the Great Rift Valley on the Ethiopian Highlands. The research group kept track of 348 individual geladas over the course of the six and a half year study, noting their health, reproductive status, and any birth or death. These monkeys are also commonly infected by a species of Taenia which uses the geladas as an intermediate host. The final host for this parasite is most likely the Ethiopian Wolf (Canis simensis) - which shares the same habitat with the geladas. Even though this carnivore usually only hunt small mammals such as rodents, they are known to scavenge on gelada corpses - which is probably how they become infected with T. serialis. When geladas accidentally ingest tapeworm eggs which had come from the wolf's faece, the parasite proliferate in the monkey, forming cysts or bladdders which can become visible as protrusions on the skin. While the cysts are grotesque, this allows researchers to monitor infections in the monkeys without coming into direct contact them (which might affect their natural behaviour). But while the cysts are clearly recognisable on the gelada's skin, one cannot simply identify a parasite via skin cysts alone - a closer examination is necessary. Fortuitously (for science anyway), during the course of their study they were able to obtain some parasite material for identification due to a serendipitous event. Some members of the research group noticed an adult female gelada they named Frodo had a large parasite cyst on her back. At some point, the cyst ruptured and spilled out a bunch of parasite larvae, enabling the researchers who were following Frodo at the time to collect some of the parasites for examination, and subsequently identify them as T. serialis. While this tapeworm is usually known to infect rabbits as an intermediate host, on the Ethiopian Highlands, they infect geladas. Overall, the researchers found that one in six of the monkeys they monitored had at least one T. serialis cysts, and most of those afflicted were adults with one-third of the adult population showing signs of infection by the tapeworm at some point. Those infected monkeys are more than twice as likely to die than their uninfected comrades, and this tapeworm's impact extends beyond the individual directly infected with it. Infants born to tapeworm-infected mothers are twice as likely to die before their first birthday compared with infants that have mothers with no signs of infection, and infected female monkeys also experience a longer lag period between the birth of each offspring. Male monkeys also lose out due to T. serialis infection - geladas are polygamous species that organise themselves into so-called one-male units (OMU), each consisting of a single male with a harem of females. The researchers observed that tapeworms infection compromises the male monkeys' ability to hang on to their harems and infected geladas are more likely to lose in a dispute with any new (uninfected) challenger(s) that appear on the scene. The impact of parasites on most wildlife is not well-understood, and often their effects are not immediately visible without a sustained long-term ecological and demographic study. Even natural levels of infection can have profound impact on host population, as seen with the effects of T. serialis on geladas. Therefore when it comes to wildlife conservation, it important to be mindful of parasites and the hidden role they play on the stage of nature. Nguyen, N. et al. (2015). Fitness impacts of tapeworm parasitism on wild gelada monkeys at Guassa, Ethiopia. American Journal of Primatology 77: 579-594.